Shooting Tragedy Strikes in the U.K.
On Wednesday morning, taxi driver Derrick Bird went on a shooting spree in the rural region of Cumbria in northwest England, killing 12 people and injuring 11 others. The massacre began near the village of Lamplugh at 10 a.m., when Bird, 52, shot and killed his twin brother David. Over the next three hours, he drove from village to village in the beautiful Lake District region with his shotgun and .22-cal. rifle, cutting down people at random. Then he drove to his favorite beauty spot and killed himself. As the community tries to comprehend why Bird, who was well known and liked, would commit such an atrocity, his actions have forced Britain to revisit old questions about gun control. This kind of thing is not supposed to happen in Britain, which prides itself on its strict gun laws, pointing to the relatively low rate of gun-related deaths  39 in 2008-09  as proof of their effectiveness. There is no constitutional right to bear arms, and there is a blanket ban on the ownership of handguns. Anyone who wishes to own a firearm or shotgun  and Bird used both  has to be thoroughly vetted by the police and granted a renewable license. The latest figures for England and Wales show that, in a population of more than 60 million, there are 138,728 people with certificates to hold firearms, owning 435,383 weapons among them, and 574,946 shotgun certificates covering 1.4 million shotguns. The countries do not have an armed police force, although the increased threat of terrorism in the U.K. means more police are carrying arms in specific areas such as airports and some public buildings. 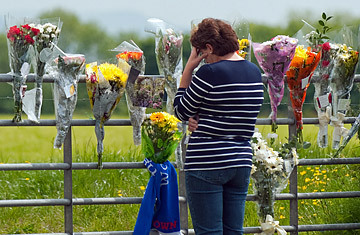 So far, the tragedy in Cumbria has not sparked calls to further tighten Britain's gun laws. It was in reaction to two previous incidents of mass murder involving firearms that the laws gradually became more strict over the last 20 years. Now they are the most stringent in Europe and among the toughest in the world, leading to complaints from sports and game shooters that they are being penalized unfairly. The British Association for Shooting and Conservation, for example, has already urged the government not to further tighten gun control in the wake of Wednesday's shootings, for fear of the negative effect that could have on the rural community and sports shooters. On Thursday, Home Secretary Theresa May addressed speculation that there might be moves toward even stricter laws by saying, "It would be wrong to react before we know the full facts." Besides, even with the most stringent laws in place, nothing can legislate for the psychological state of mass murderers. It was the horrific events of August 1987 in Hungerford, a quiet town 50 miles (80 km) west of London, that sparked the first major crackdown after 27-year-old gun fanatic Michael Ryan, dressed in military-style clothing, took a pistol and automatic rifle and shot and killed 16 people, including his mother, and injured a further 15 before killing himself. The demands for gun control that followed the killings led to laws that outlawed ownership of, among other things, semiautomatic and pump-action rifles, short-barreled shotguns and self-loading rifles. Anyone wishing to own a shotgun, like farmers, had to register them and keep them in locked storage. But none of those changes prevented the U.K.'s worst shooting just nine years later, when Thomas Hamilton, 43, walked into a primary school armed with handguns in Dunblane, Scotland, and shot and killed 16 children and their teacher, before killing himself. Hamilton had licenses for six guns, and so the Dunblane murders led to new laws banning the ownership of all handguns. Bird was a licensed gun owner who had held a shotgun license since 1995 and a firearms license since 2007. Reports from friends and acquaintances describe a "normal, friendly" man who seems to have "snapped." So while Wednesday's massacre will surely reignite the gun-control debate, the bigger questions will be: What turns an apparently normal, friendly man into a mass murderer? And how do we stop it from happening again?